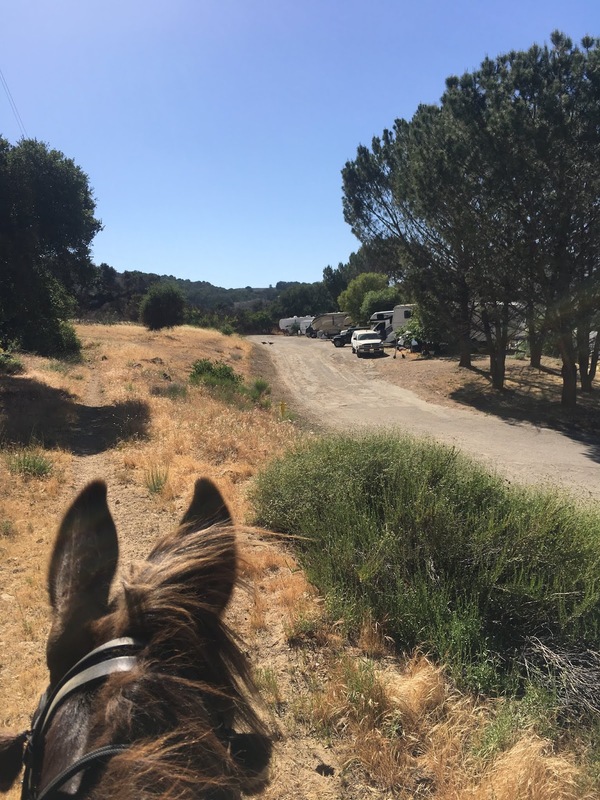 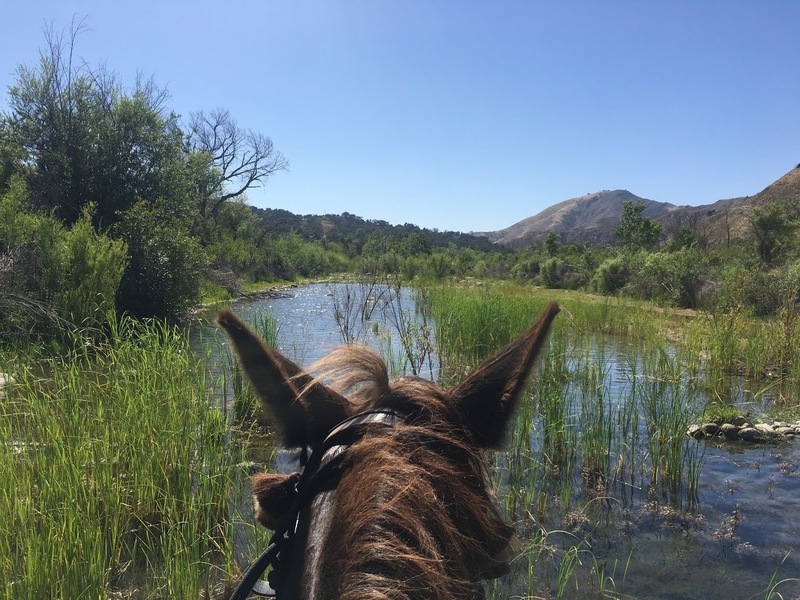 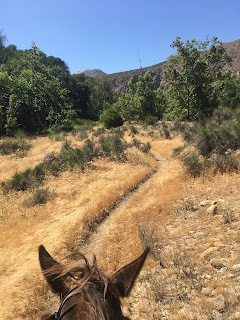 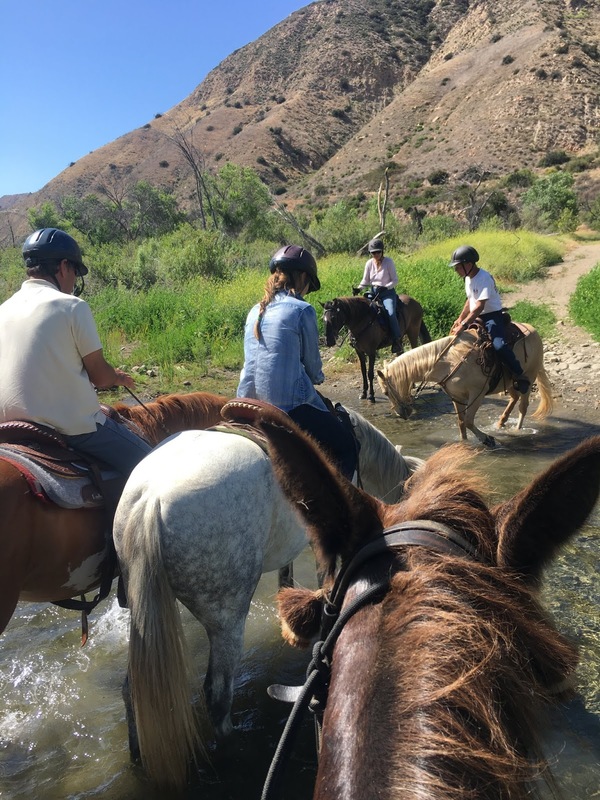 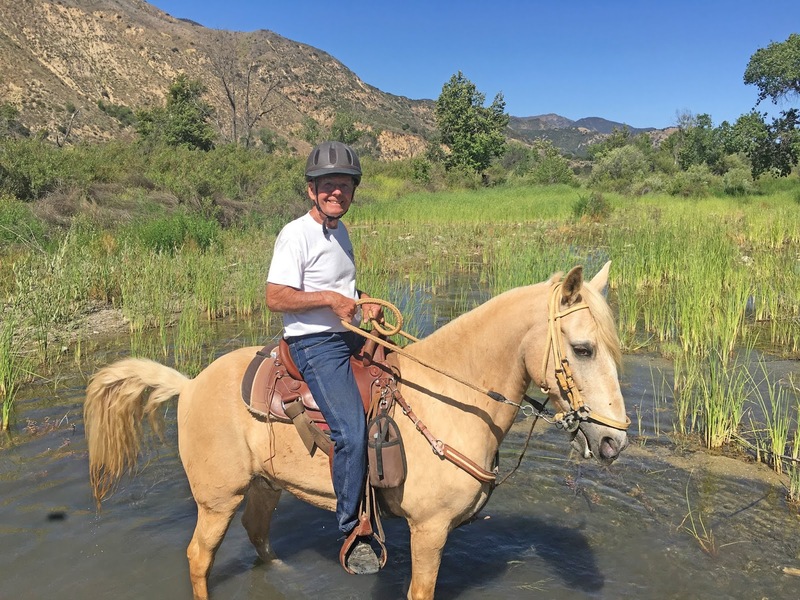 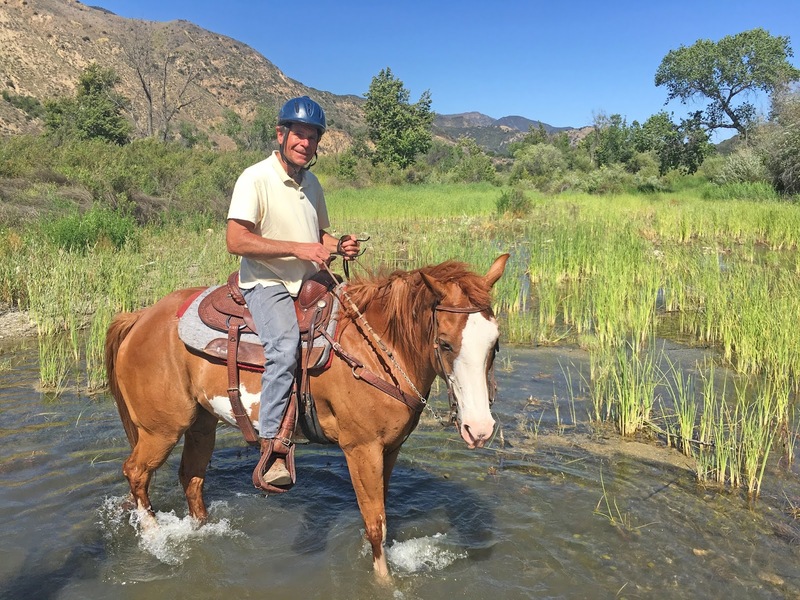 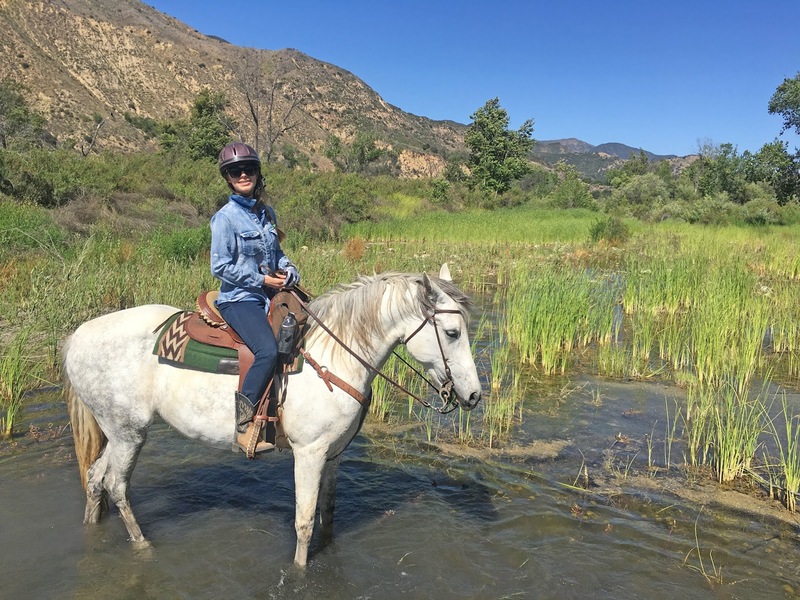 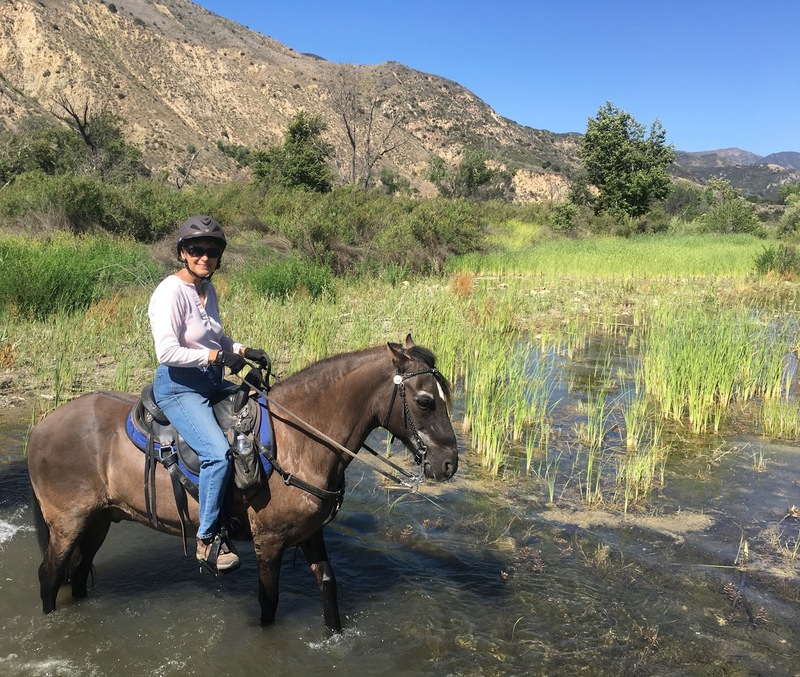 Today the Los Padres Trail Riders decided to have a 3 day weekend campout at the Rancho Oso Thousand Trails Resort, so I showed a small group of riders some of the nearby trails. We rode 90 minutes on a breezy sunny afternoon, going 3.11 miles in the trails directly adjacent the resort. 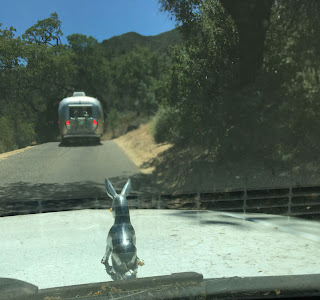 One of the things about driving out Paradise Road to Rancho Oso is that the road is very narrow. I happened to follow a beautiful vintage Airstream in, and it clearly took up 3/4 of the road. If someone with an equal-sized vehicle or horse trailer had been coming out, well, there would have been a standoff with a dropoff on the side of the road. 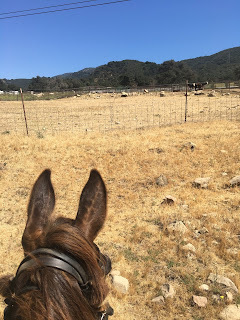 Tobe is very interested in these cows in the top right of the photo. 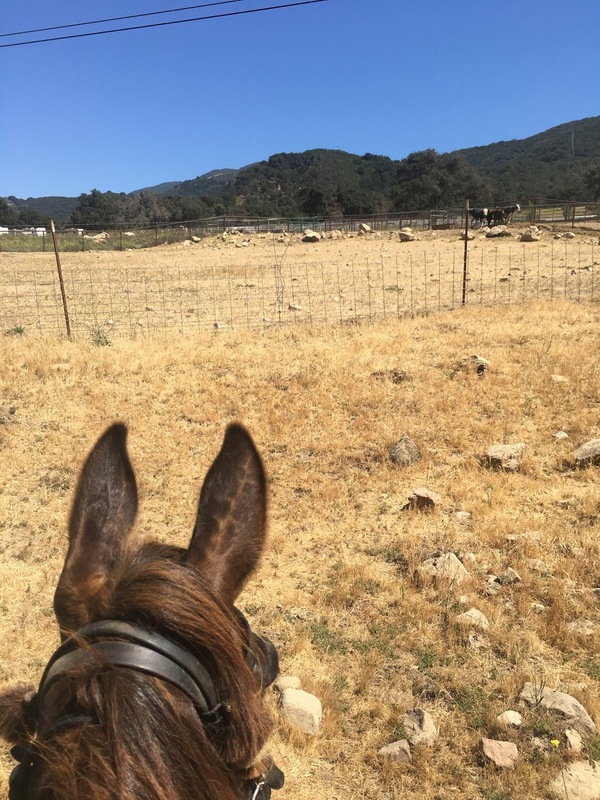 They are kept close to the arena for rodeo practice and are a part of the ambiance of the Rancho Oso, letting visitors experience a bit of the cowboy lifestyle within minutes of Santa Barbara. 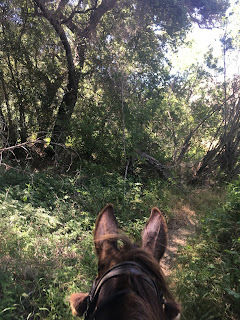 Because the group only wanted to do less than a 2 hour ride I took them through a very green forested area that runs adjacent the Santa Ynez River. 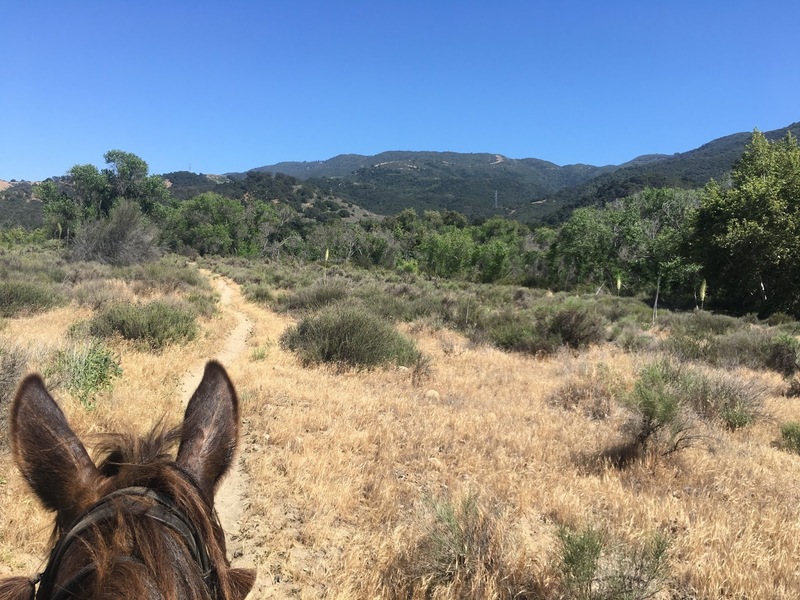 It is filled with quaking aspen trees and lots of poison oak in the underbrush, but careful riding through poses no risk of exposure to the toxic leaves. 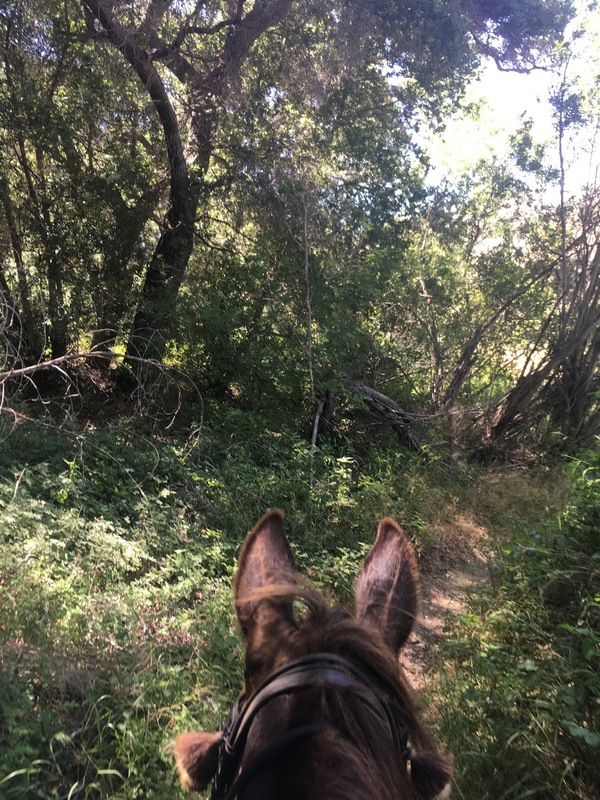 A lot of the trail is overgrown and lush with growth, but the mighty mule led on. 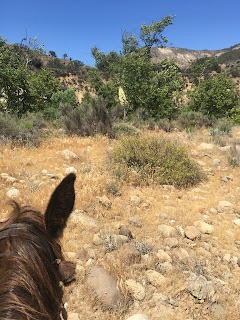 When we turned around to head back I took them closer to the river, where a well-trod path passes along the rocky ground. 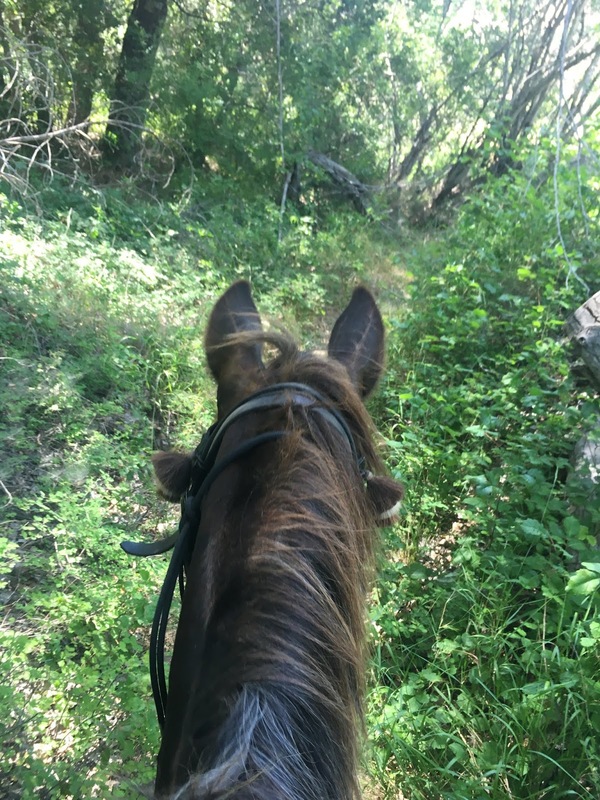 Then I was a bit naughty, because Mr Mule is an ATV, and I led the group across some non-trail areas just because I think it is good for the equines and their humans to be able to go off-trail and pick their way cross-country across rock fields. Then back to the trail, and by this time it was a good idea to let the animals have a drink in the river and soak their ankles after that workout. 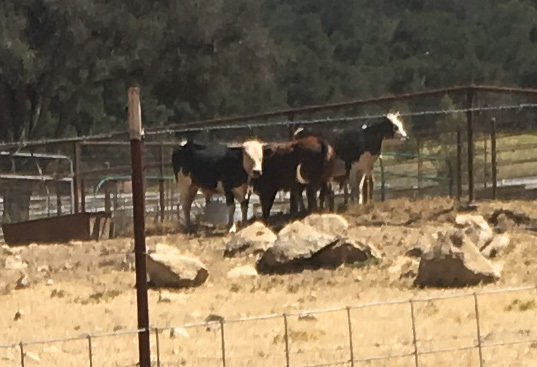 And all of them smiled for the camera. 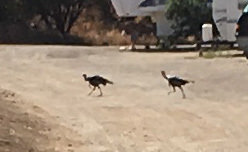 Then it was time to head back for a pot luck dinner, so we followed the trail up across the campgrounds, and saw a group of turkeys running away from the bar-b-ques in the campsites. 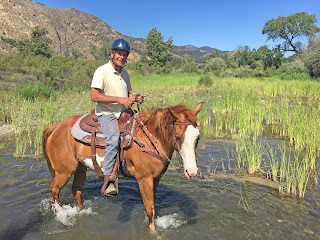 Just never know what kind of wild life you might encounter when you choose to explore the great outdoors! 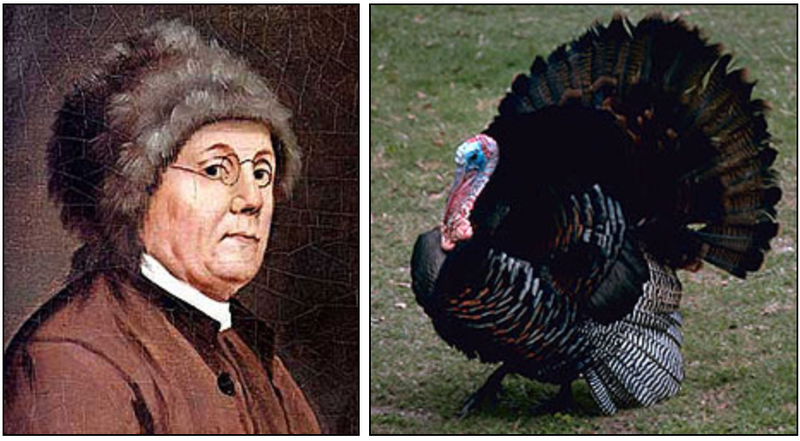 In fact, Ben Franklin lobbied for the turkey to be the National Bird, instead of the Eagle. "For the Truth is the Turkey is in Comparison a much more respectable Bird, and withal a true original Native of America... He is besides, though a little vain & silly, a Bird of Courage, and would not hesitate to attack a Grenadier of the British Guards who should presume to invade his Farm Yard with a red Coat on."